Scented Sea Glass Glycerin Hand Soap 16oz. Home > Handmade Soap > Scented Sea Glass Glycerin Hand Soap 16oz. Scented in our Mermaid Tales scent -fresh apple,melon, orange bergamot blended with lavender, rose with a hint of violet musk. 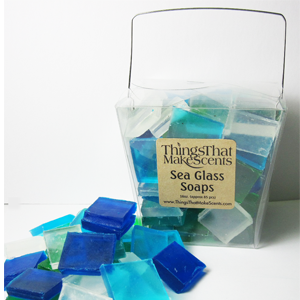 Sea glass hand soaps come packaged in clear box. The perfect soaps for your beach house bathroom. Great for gifts or indulge yourself! Being a handmade item, your actual item may vary slightly from photo.